The Fangirls Guide to the Galaxy author Sam Maggs says it's important for young women to be proud of their geeky obsessions. You don't have to prove your nerd cred to anyone. You can dress however you like. You don't have to settle for sidekick. Sam Maggs has learned some things while navigating both on- and offline spaces where geeks gather. The Mary Sue editor and writer joins Shad to share her rallying cry to fellow nerd girls and explain why she felt a woman-centric primer — covering everything from online harassment to obscure terminology — was badly needed. Her new book, The Fangirls Guide to the Galaxy, encourages young women to unapologetically embrace their love of fantasy, sci-fi and other obsession-worthy worlds. She also stresses that, although the internet can be a tough place for women, it's not all taunting and trolling. "We've been able to find each other and build these really supportive communities," she says. 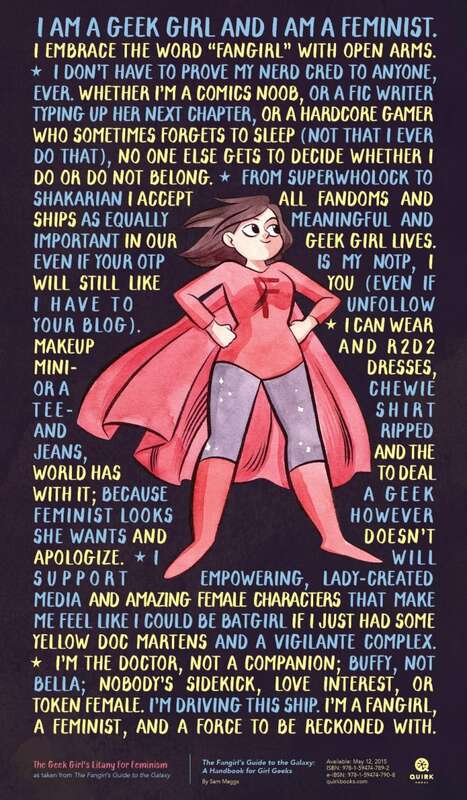 WEB EXTRA | Read Sam Maggs' geek girl litany for feminism below, or watch her recite the closing line on our instagram page! Why is Vladimir Putin recruiting U.S. action stars? Tatiana Maslany: "For me, it's always been about the work"